Fourth Chakra wisdom tells us our heart is a place where we go to feel love and find forgiveness; it is true that someone with a closed heart can experience neither. We are also told to follow our hearts, to listen to them, to open them, to come from them. No other organ in the human body possesses as much symbolism to the human experience as the heart. I post often about the need to sit in our hearts, and this is wholly and completely the reason why. It is our source of inner wisdom and the pulse of universal connection. If we shut off from our hearts, we don’t just shut off to love and forgiveness. We shut off from our soul’s calling and the security of being guided towards it. Our heart is a complete vessel for our journey. It is a built-in navigation system, showing us the way. And it also gives us the courage to fuel the journey forward. It is at once the means, and the destination. I learned recently that the etymology of the word courage comes from the Latin “cor,” also meaning “heart.” Had the cowardly lion known this from the get-go, he could have saved himself a trip to Oz! Following our hearts most times means taking risks – a small contingency that often thwarts people from taking the heart’s journey. But, how perfect is it, then, that the heart also supplies us with the courage, the means, by which to overcome the fear of risk taking? It really is the one-stop-shop. My point is this: follow your heart. Listen to it, heed it. And it will provide you with everything you need to get you through. Fear and resistance will inevitably come up, but stay the course and trust. Your heart really will light your way on. Okay, first things first. The “Yumm” has been revised. I wasn’t 100% happy with my reincarnation of it, so I did some tweaking and I think I finally nailed it. So give that baby a try and let me know what you think. 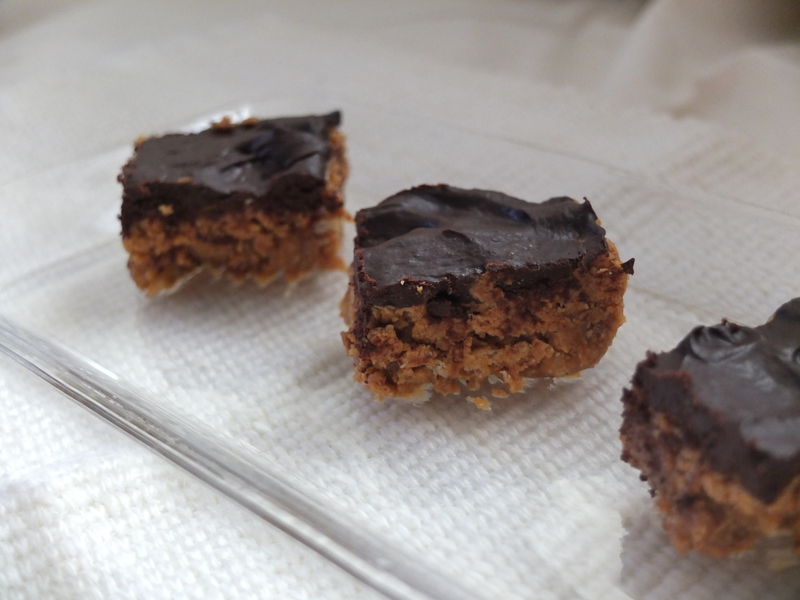 Following last week’s blog, I had quite a bit of interest in the Chocolate Peanut Butter square thing I mentioned consuming, so it seems fitting that I post the recipe here. It is based on Dreena’s Chocolate Hemp Squares from Vive Le Vegan; I mostly just swapped out the hemp butter for good ol’ pb. This is for you DJ. Melt together nut butters, maple syrup and vanilla, but do not let boil. Remove from heat, stir in cereal and pour into pan, squishing into the pan – I used a loaf pan ‘cause I didn’t have the recommended 8×18 cake pan. Now put it in the freezer to firm ‘er up. In a heat proof bowl, warm chocolate chips and soy milk over boiling water, stirring constantly. Pour over firmed up peanut butter mix and let cool. You may not use all of it depending on what pan you use. In the loaf pan, this made the chocolate layer very thick (and dangerously delish I might add!). Once cooled, you know what to do.